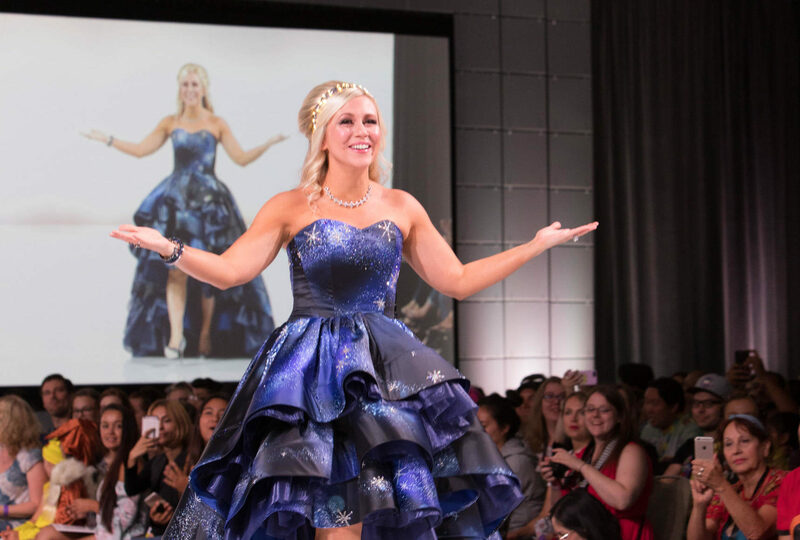 Here’s a true story: I went to the HerUniverse fashion show at San Diego Comic-Con and I cried. Not like, a sobbing hysterically situation, but sitting there in the audience, I welled up a few times. Not only were the outfits amazing, but the message and stories behind them were so moving I couldn’t help but get a little bit choked up — and that’s not even counting the part when HerUniverse founder and emcee for the evening, Ashley Eckstein, went into the audience to ask young girls about their hopes and dreams. One young girl told Eckstein her dream is to make a Disney movie, another said she just wants to live somewhere with all her friends nearby. The third? Her dream is to get a puppy. There are two things guaranteed to make me cry in life: Puppies in general, and listening to young girls talk about the future. And if there’s one person who knows about achieving their dreams, it’s Eckstein. Eckstein — for those who the name doesn’t immediately ring a bell — created the widely popular HerUniverse back in 2010 when she realized there just wasn’t a place for female sci-fi and fandom fans to find stylist, fun, and affordable clothing. She also happens to be the voice of Ahsoka Tano, the fan-favorite Padawan of a one Anakin Skywalker in Star Wars: The Clone Wars (and later, Star Wars Rebels). If that’s not enough, she is a constant voice of support and positivity for girls — both young and old! — out there in the world. What follows is Part 1 of my delightful chat with Ashley about inspiring young girls, fashion, and Disney magic . HelloGiggles: When I was growing up, things like HerUniverse weren’t around. I didn’t have multi-faceted successful females, like you, to look up to. How does that make you feel to know that these girls are looking at you for hope and guidance? Ashley Eckstein: Oh my goodness, it’s definitely something that I do not take lightly. It’s something I take very seriously. I feel very fortunate that I had two wonderful parents and several great teachers, and obviously Disney, to provide me with inspiration growing up. So, I just want to be able to give back even an ounce of I feel like what was given to me. I think a role model should be somebody that is close to you in your life, but I do realize that as an actress and somebody in the public spotlight, whether you like it or not, you are a role model. Especially as the voice of a Star Wars character as powerful as Ahsoka Tano, I take it very seriously. I can’t put my head on the pillow at night if I feel like I’ve led anyone astray. In fact, I want to know that I’ve done everything I could do that day to be a positive influence, and live up to, I feel like, the honor that’s been bestowed upon me. It’s incredible and I do everything I can. I only wish I could do more. HG: Well, you’re doing a great job, so thank you. Do you have one specific moment that stands out, when you can tell that you’ve changed someone’s life? AE: You know, the fashion show is an amazing moment every year because the main reason I started it was to provide designers with a platform to really achieve their dreams and to create opportunity, to create professional opportunities for them. Year after year, I am now told stories of designers that are achieving their dreams. Or, even not even designers, models that said, ‘Because of this opportunity it’s given me the confidence to go do what I want to do.’ [Editor’s note: The fashion show is made up of real girls, not actual runway models!] Or even, you know, little girls that just walk the runway during intermission that are inspired by watching other people achieve their dreams. They’re like, ‘Oh my gosh, I can do this, too.’ We have a whole group of junior designers now that are too young to actually compete in the fashion show, but they follow us now and they’re inspired to be fashion designers, or they’re inspired to follow their dreams. That is an incredible reminder of what we’re doing actually is kind of getting to people, and kind of inspiring people. That just kind of ignites that fire in me to keep going and keep doing it, because that’s all I want. I see the dreams that the dreams that you wish can and do come true. It just makes me want to spread that message so much more. HG: Let’s talk about HerUniverse, because I love it. How do these ideas and things come to you? How do you look and say, “I want to make a Disney Parks land outfit?” Because that’s my new favorite one right now. I saw the sketches, I’m so excited. AE: You know, I feel like, as a lifelong Disney fan, as you heard [during the fashion show], those are just ideas and wishes and dreams I’ve had in my head ever since I was a little girl. I’m so inspired by Disney, so inspired by the parks. Then also, like I said, it takes a team, especially for the Parks line. I have teamed up with Ashley Taylor, who is an upcoming Disney artist. We’re both very, very similar, so essentially kind of what I see in my head, she can make pretty in terms of art. So we just kind of collaborated from the Alice teacups. I can’t take full credit for that, as well. That was one of the creative directors at Disney Parks. That’s been a dream of his for a while, to make those teacup skirts. So we were collaborating one day. We have a mutual love of Alice in Wonderland and he said, “If you can ever those teacup skirts happen…” So, that was kind of the labor of love of a couple of people. AE: I am so obsessed with the Mansion! Yes, so we’re starting with those three designs, the ballerina dress, the ballroom dress and what we’re calling our Mansions Around The World skirt. But definitely expect more from anything that’s at Parks. HG: Do you have a favorite design coming up? AE: Coming up would definitely be the Alice teacup skirts and the matching cardigan, because I am massive Alice in Wonderland fan. Come back tomorrow for Part 2 of my chat with Ashley.